We’re witnessing an expansion in POS systems to meet the needs of various retail businesses – from quick service restaurants (QSR’s) to established businesses and pop-up shops. Touch screen POS systems can be embedded in kiosks, handheld portable devices and cashier connected stations, providing a range of different advantages to both customers and retailers. For example, touchscreen kiosks offer a faster shopping experience for those accustomed to on-screen shopping. A portable POS touch screen offers flexibility in how and where payments are taken, suitable for to table service, pop-up stores, and open-air markets. A critical component of today’s POS systems is integration with a CRM portal which makes it easy to track purchasing behavior, offer loyalty cards and reach out with customized information about new products and offers. Touchscreens can enable customers to sign for credit cards right on the screen saving time and eliminating possible paths to identity theft. Touchscreen POS systems are not only being reconfigured into a range of sizes and capacities but are also combining with advances in software. Since 2017, restaurants such as KFC in China are utilizing ‘smile to pay’ facial recognition in their POS touchscreen kiosks. Other POS systems are adding DigitalPersona U.are.U® Fingerprint Readers, in order to eliminate the need for personal identification numbers (PINs) and to prevent payroll fraud and unauthorized transactions. It may be some time until we see these offerings elsewhere. 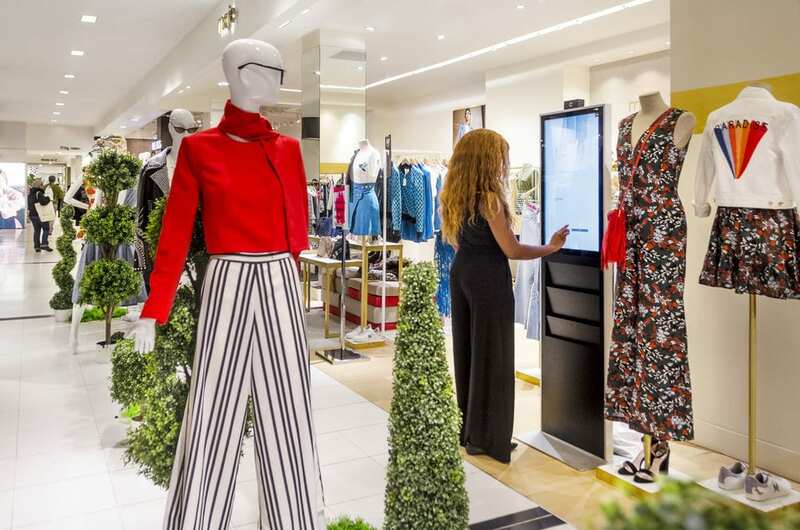 Metroclick touch kiosks have provided numerous department stores and popup shop customers with the option to customize and check out automatically in store. In their work with Dresshirt, a customizable tailored shirt brand, this checkout system allowed customers to try on standard shirts for size and design their own, fusing the seamlessness of online point of payment with the in-store ability to try on the products themselves. 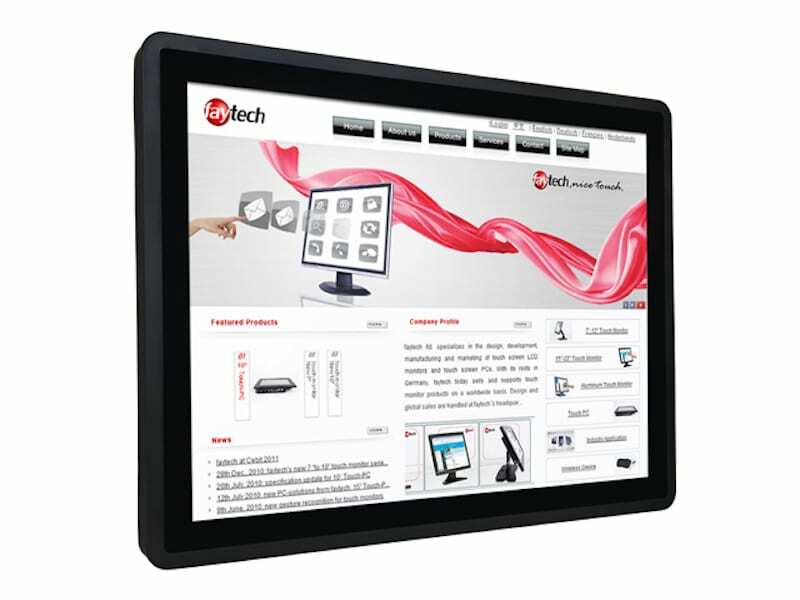 In restaurants, Metroclick products are outfitted with 21 or 32 inch touchscreen monitor with HD LED display and ten-point touch configuration. Metroclick relies on faytech touch kiosks and smaller capacitive screens to create their efficient, direct-to-consumer POS system. For more traditional cashier-facing point of sale, Clover’s latest offering is an upgrade to Clover Mini. The Clover Mini (2nd Generation) is a countertop device. Clover’s Apple iPad hardware is coated with an Antimicrobial Corning® Gorilla® Glass. It provides system capability to transition between a merchant-facing and consumer-facing mode as well as on-screen PIN entry. Retailers can take payments, from magnetic stripe, EMV®chip, standard cards, and contactless payments, without additional equipment or software. That said, because their iPad hardware is an otherwise consumer facing product, Clover’s markups are high, driving up base cost for retailers, restaurants, and entertainment hubs. In mid-2018 Toast expanded their suite of restaurant POS offerings with Toast Go, a 6″, fully integrated handheld POS system with a case and magnetic strip, They previously offered an 8″ handheld device in partnership with Samsung for pay at the table service. Toast’s hardware is the Android-version of Clover, using a Samsung tablet as the fundamental checkout screen. Again, markups are higher because their tech integrates hardware most likely purchased at retail prices. The winner here is Metroclick’s POS offerings with better value than Clover or Toast, but regardless, it’s exciting to see products with slightly different offerings as they evolve from earlier iterations to best suit the end customer. For more information on faytech’s POS hardware offerings, contact us.